While PlayStation, Saturn and PC owners enjoyed playable demos of the latest games, often given away for free on the cover of gaming magazines, those who owned an N64 went without. A promotional VHS tape full of gameplay footage was about as much as a Nintendo fan could hope for. The arrival of the GameCube saw Nintendo turn their back on expensive cartridges – for the console market, at least – but anybody expecting future issues of the Official Nintendo Magazine to come with a demo disc from thereon in was in for disappointment. Despite GameCube discs costing relatively little to produce, the platform holder reportedly wasn’t too keen on the idea of playable demos for first-party titles. Nintendo simply believed demos may lead to a false impression of the final game. Their reasoning was, and still is, understandable. Games can change drastically during their final months of development – key features change, and in some instances are completely dropped. Later levels in some games can also look and feel remarkably different to the first few, being more action orientated or vice-versa. A small amount of third-party companies were still keen on the idea of GameCube demo discs though, eager to get their upcoming games into the hands of consumers. Nintendo went as far to take this matter into their own hands, releasing a collection of “previews” on a single disc, available at certain retailers for a few dollars. 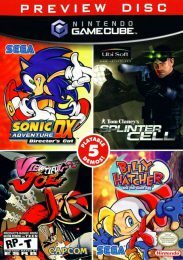 The untitled preview disc contained trial versions of Soul Calibur 2, Viewtiful Joe, Sonic Adventure DX: Director’s Cut, Tom Clancy’s Splinter Cell, and Billy Hatcher and the Giant Egg. Video footage of a few first and third-party titles also featured, along with Dr. Mario on NES and a trial of WarioWare that could be downloaded onto the GBA’s temporary storage via a link cable. Many of these demos also made it to Europe, albeit on standalone discs. The distribution methods for these were a little peculiar. For instance, the demo of Tom Clancy’s Splinter Cell was given away with Future’s NGC Magazine, but only if it was purchased from Woolworths. UK retailer GAME issued P.N.03 Billy Hatcher and the Giant Egg, and Viewtiful Joe demos, meanwhile. Rather than simply give them away, they were available only to those who coughed up £1.99 to pre-order the game in question. At the time, this struck us as being rather backwards. Demos are used to fuel pre-orders, but in this situation, the decision to make a purchase was being made before trying. 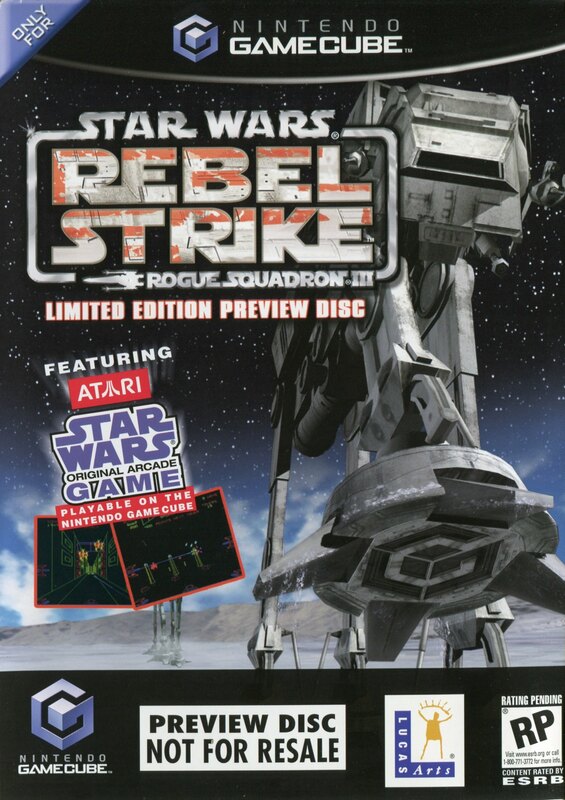 The demo disc for Star Wars Rogue Squadron III: Rebel Strike was something of an exception, being more of a ‘bonus disc’ than a regular demo. It remains popular with collectors, and for one good reason – in addition to a one level demo and footage of other LucasArts titles, it also included Atari’s ace 1983 vector graphic Star Wars arcade game. 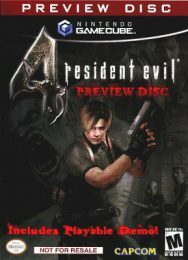 Later in the system’s life, Capcom ran a similar promotion with Resident Evil 4, giving away a RE4 ‘Preview Disc’ with pre-orders. 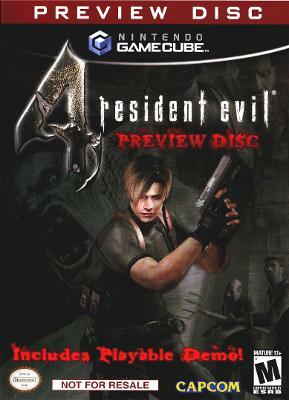 A quick glance on eBay reveals that £10-£15 is the going rate – around double the cost of Resident Evil 4 on GameCube. In fact, all the demo discs mentioned here are sought after by collectors nowadays. Due to being distributed in small numbers, and often having an upfront outlay involved, they never managed to reach quite as many gamers as publishers probably liked. To say they’re uncommon, or even rare, isn’t an understatement. To elaborate: the only P.N.03 demo disc on eBay currently is listed at £200 on a ‘Buy It Now’ auction. While this doesn’t necessarily reflect its true value, it does illustrate its scarcity. If you pre-ordered either P.N.03, Billy Hatcher or Viewtiful Joe from GAME many years ago, the ‘free’ demo you took home that day is now almost certainly worth more than the full release. Some twenty years on, the good old ‘Nintendo Difference’ is still in effect.